Jasminum Nudiflorum, and lots of bells on Wisley Cream. love the Wisley Cream all your garden looks a winters treat! My winter garden usually has more flowers than my summer garden ! ... Lol. I enjoy looking out of my windows at my winter gardens. how beautiful terra! :) a lovely double flower! Wow ! Absolutely beautiful ! My Wisley Cream is looking a bit sad at the moment ! Good thing you typed 'Peeping' correctly. 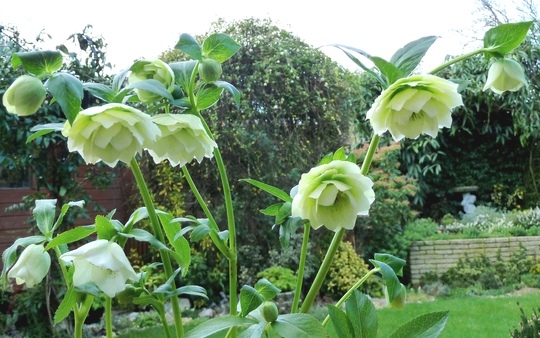 Great photo Terra, I love Hellebores, such a welcome sight at this time of year. Thank you Amy, Jaykaty and Chris .. Yes ... such a wide variety of hellebores these days ..
... lovely to see, aren't they. Really lovely Hellebore Terra. At last there is some Spring colour in the flowerbeds, to chase away the gloom and lack of sunshine. This is the first Hellebore I've owned ! I only have two in this little garden Terra, but both seem to be doing well and have lots of buds on. Beautiful colour - something between ebony and light green. Hi Kat ... thanks .. Yes, they are. Do you know its name? They are really lovely flowers and so many sorts... your weather is far ahead ours. Although we had mild winter and spring weather for almost a week, many early flowers are still dormant.